This expansion is just a hodgepodge of ideas that are poorly executed and put together in a fairly lackluster way. Opportunity to gain a couple of new Traits, some cool new jobs and objects, nice new skill with good benefits. Sims at home stuck in limbo, dorm life is poorly set up, new life state seems out of place, questionable use of new harvestables. 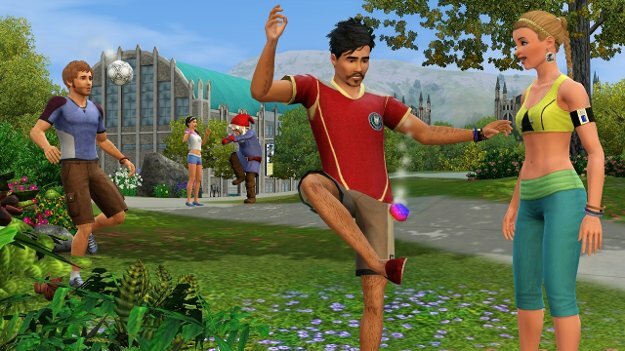 The Sims 3 University Life is another repackaging of a Sims 2 expansion, with the intention that a previously well received expansion will do well with some changes and additions. Sadly, Sims 3 University Life is lacking in a multitude of ways, showing itself to be a generally disappointing expansion. It not only fails to significantly improve the University experience, but it seems to backslide in a few ways, making the game not quite as fun to play. 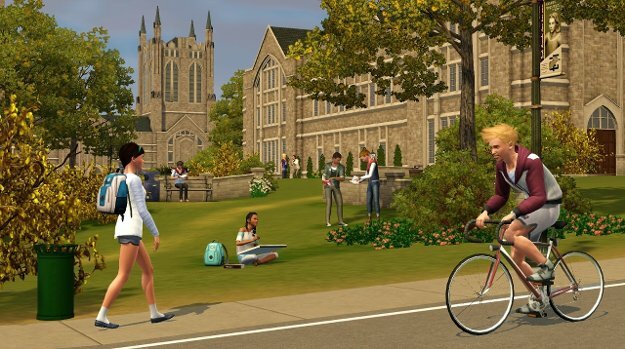 Overall, the idea of University is a pretty strong one in a game like The Sims. Go to University, do some cool new interactions, get some benefits for having gone and bring that back to the main game for a boost over all the other Sims who didn’t go through the effort you did. Great, right? It was great in the first University expansion pack, which actually did an amazingly awesome job of allowing Sims to go away to college, have some cool new interactions and gain access to new jobs that other Sims couldn’t. It was a pretty win-win situation. With this University, however, your Sims seem hampered at the very start. Sims 2 University allowed players to start off with a brand new Sim and immediately dump them into the college experience. They were able to enjoy the college experience and its benefits without having to worry about too many distractions, save the ones that the player created. When they were done, they got to go home as adults to live out the rest of their lives. In Sims 3 University, you seem to be expected to play be playing a generational game in order to get the full benefit from the expansion. 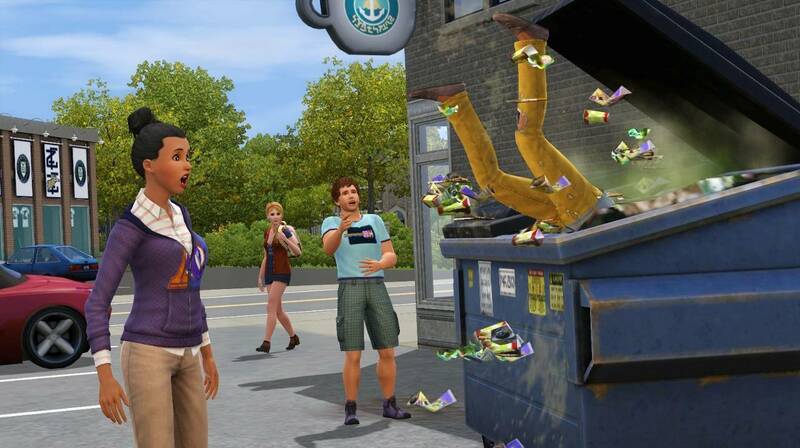 For starters, in this expansion, Sims pay for their University experience, unlike in the previous expansion. So if a player has started off a brand new Sim, bought them a house and maxed out their available cash in trying to set them up, they might not have the money to send them away for the experience. In addition, instead of being just based on completing semesters like in the first one, this expansion requires Sims to complete a certain amount of credits. Bonus credits are given to Sims with certain traits and levels in skills. So again, a starting character with no skills is at a disadvantage with being forced to go to school longer to graduate. They can also miss out on scholarship money that a Sim with more skills would be able to pick up on. 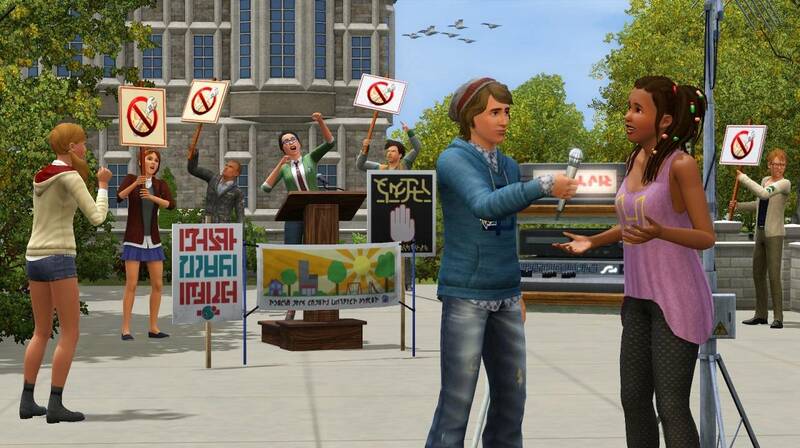 Once in school, the experience itself is a little improved, with the expansion taking advantage of the “neighborhood interaction” vibe that the Sims 3 introduced. Some of the classroom experience is actually in a lecture hall that you can watch your Sims in and direct them for the experience. So instead of having all of your classes in rabbit holes, you can actually direct your Sim to sleep in class and watch as they snooze instead of listening to their lecture. This, however, is only a very small improvement, as the rest of University is much the same. Interact with fellow students, go to parties and generally try to keep your Sim happy as they study. There is, however, a huge backslide in the way the actual University experience is set up in this expansion. Now, dorm living has never been a piece of cake for everyone involved, but Sims 3 took an experience that was ok in the Sims 2 and made it a whole lot worse. There was always the problem of people leaving behind messes and spills which would send your Sim into a spasming fit as they stomped their foot and complained about the environment score going down. But in the least, you could clean up the areas you frequented and call it a day. After all, it’s not like you also had to worry about making your own meals when you were in a dorm. The in dorm cafeteria took care of that. Except, in this one, there is no in dorm cafeteria. “So what?” you may ask. “What’s the big deal?” you may say. So let me give you my very first experience playing in a Sims 3 dorm. It’s my third day at University in the week long semester I’ve chosen to take. I’m away at class, gaining knowledge and working hard at my degree. Suddenly, I get a pop up telling me that there’s a fire on my home lot. That’s right, a fire. One of my dorm mates who had no skill in cooking decided to make themselves lunch, seeing as how there was no handy dandy automatic meal maker like in the last expansion. They, predictably, started a fire on the stove with their lack of knowledge. The fire was eventually put out, but alas, half of the items in the kitchen were burned beyond usage. Insurance was kind enough to give me some money to cover the cost of my loss, of course. However, the money I was given was not enough to replace all of the items that were damaged. Because of course, it’s MY home lot so I must replace the items. Using insurance money and whatever funds I have in my own personal account. So I can either waste my own money to replace something that should never have been destroyed, or I can keep using a kitchen that’s dirty due to the burnt objects inside. I chose to keep using a dirty kitchen with burnt objects inside. I consider this to be a massive flaw and a major step backwards from the first expansion. It was a poor change to a system that worked well. Also, in the first University expansion, players were able to swap back and forth between the University lot and the home lot. Not so much in this expansion. Once you go away to college, forget about mom, dad and any siblings. They will be standing in place, waiting for you to return and doing exactly the same things they were doing when you left. Talking to the same people. Still driving home from work. Stuck in place, forever, until your return. Now when I went to college, life went on without me. As a matter of fact, whenever anyone goes to college, life moves on without them. Sibling grow up, parents get raises, and pets die. The people that you know and love change and evolve on you, because you going to college is not so earth shattering that it pauses their entire lives. And in the Sims 3, one of the major selling points of the game was how dynamic it was with the living neighborhood, how families grew, people died and changed jobs, all without you having to control them. It was a living, breathing environment that made the game more exciting as a whole. So to come into the University expansion and to have that aspect of the game excised was very odd and unsettling. Where’s the option to continue playing your home lot? Where’s the option to have the neighborhood continue on without your intervention? 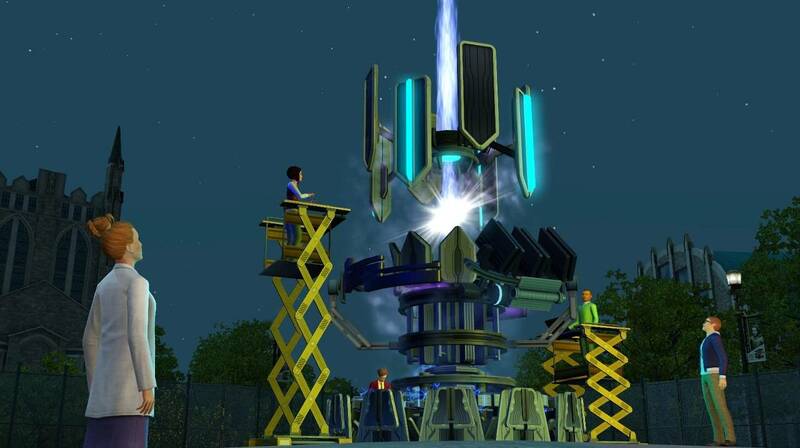 The Sims 3 engine seems perfectly capable of handling these concepts, yet it’s strangely absent. They already introduced sub neighborhoods in the Sims 2. The Sims 3 Adventures neighborhoods are sub ones, so this game has them as well. Simply make the University a sub hood and allow players to swap back and forth between them as they like. Or allow them to choose an option where the game controls your home Sims without your interaction; the engine is already doing it with an entire neighborhood. The fact that my Sim left for University and came back home to find her family stuck in their exact same positions was very disheartening and disappointing. The game tries to give some advantages to going to University. Sims who earn degrees get a boost in career paths related to that major as well as an extra trait for having completed. However, one of the ways to get extra credits or scholarships before starting University is by having ranks in your career. So…I can use my career levels to gain an advantage in staring University, but isn’t the whole point of University to gain an advantage in starting a career? It’s a little odd and backhanded method of gaining an advantage and it once again favors generational Sims over brand new ones starting off in the game. There is a new Science skill which gives some cool new interactions and advantages in the game, though. One of things that people with the Science skill can do is Correlate data at the Science center in town, gaining rewards at random. Experiments can be run, samples can be taken, and collectables and harvestables can be upgraded, transformed and cloned. This provides for some really interesting gameplay as well as some good cash flow for Sims players looking to maximize their family’s lifestyle. Cloning the right collectables can give an infinite supply of cash, so long as your Scientist is a member of the family. However one of the perks of being a Scientist plays into another game misstep. One of the experiments that you can run will produce a Forbidden Fruit, which gives players the opportunity to create Plant Sims, a life state from the former game brought back into this one. When I heard that Plant Sims were being included in University, however, I was a little confused. 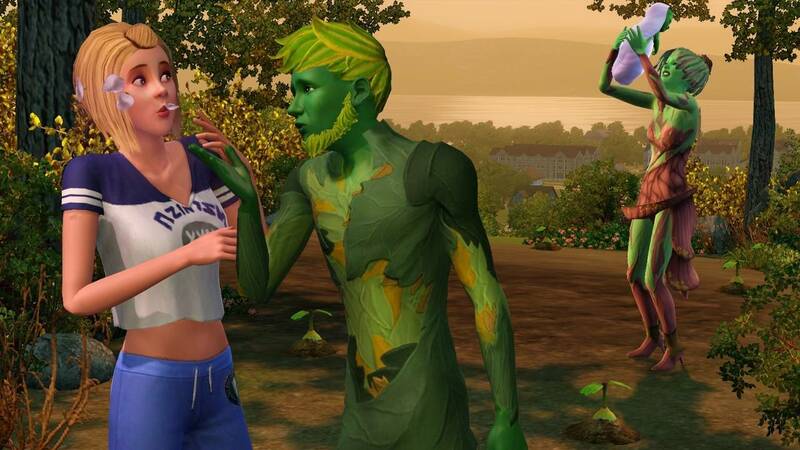 Sims 3 Seasons gave us Aliens and University is giving us Plant Sims? Those two life states seem a little backwards and ill-suited to the expansions that they were included in. For example, it seems perfectly reasonable that the new Science skill they’ve introduced would give some nice opportunities for the Aliens to be attracted to visit your Sims, while the Plant Sims seem suited to an expansion related to the weather and the outdoors. And the life state itself is fairly non impressive, without too many new abilities. Players are also hampered from creating them in a way that I thought was pretty strange. With the Supernatural expansion came the ability to go to Create a Sim and create any life state in the game. You want to create a ghost to start off with? Sure, go right ahead! As a matter of fact, you can go into the options and actually choose the way your ghost died, which changes their color in the game. All supernatural characters, including the Showtime Genies can be created from the very beginning of the game. Aliens, not being a life state, cannot be, which makes perfect sense. However, Plant Sims are excluded from the Create a Sim feature. I can understand if they wanted to make it hard to get them, however, Genies are supposed to be just as difficult to get in game, yet a player can create one from the start. I don’t understand why Plant Sims were excluded and it just doesn’t make any sense to me. 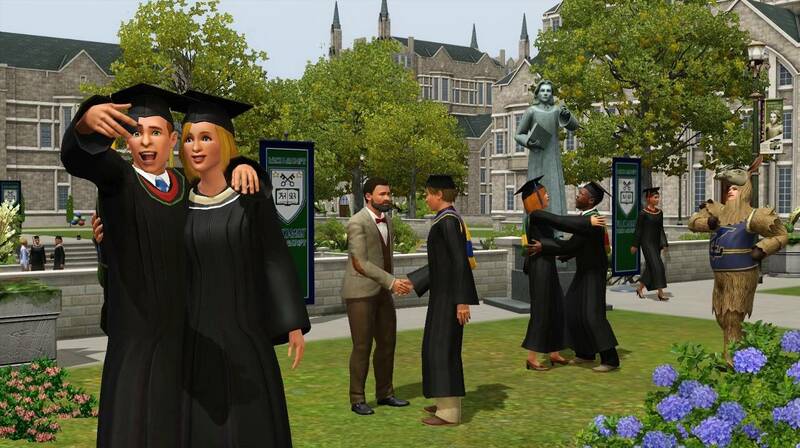 Sims 3 University also includes a new feature called Social Groups, which are supposed to enhance the University experience. The Rebels are all anti-establishment and like to stick it to the man, while the Jocks are really into sports and being jock-like. Nerds are into video games, science and the new comic books that the Sims can purchase from the book store and read. As the Sims gain levels in their Social Groups, it unlocks some new abilities and interactions which are nice in a limited sort of way. For example, the Nerds get the ability to Mind Meld, which boosts relationships and helps you learn the other Sims traits. Getting to the very top of your Social Group also unlocks a job that is specific to each of the groups, allowing your Sims some unique career opportunities. Because of the nature of the game, it is very possible to get to the top of these Social Groups without ever going to University. This, unfortunately brings up the question of why they even bothered to include them. Gaining levels in your Social Group is as simple as doing activities associated with that group. So if your Sim plays computer games and reads comics, they’re going to gain Nerd influence. If they buy a street art object and start painting up the town, they’ll gain rebel influence. No trip to University needed. Also, if you have spare Lifetime Reward points sitting around, for 2,000 a pop you can raise your influence in any of the groups, whenever you want. I took a Sim who had no influence in any group and raised his level from a 0 to an 8 with a purchase of 6,000 Lifetime Reward points. So, basically I had to do nothing related to the group to gain the Influence. On the flip side, if you don’t continue to do things related to the group, your Influence with them will drop. But with it being so easy to gain the Influence back, what’s the point of making me loose it? I almost feel like they were confused with how they wanted to handle the Social Groups and just threw a bunch of ideas together when constructing them. Also, new harvestables were added into the game, giving players the opportunity to plant herbs (yes, you can giggle) and coffee type beans in the game. However, these herbs and beans are less related to the Cooking skill and more related to just about everything else. For example, Chamomile, which is known for being a soothing herb in real life, is listed as helping Sims raise their Influence in any Social Group when consuming it. I’m a little confused as to why that’s the effect, but I sort of get it. They wanted to do something else with the herbs and beans besides just adding new recipes and meal effects. However, one of the logical additions with the herbs is very poorly handled in game. You would think that with all the new herbs in the game, you would have some really nice options for tea. 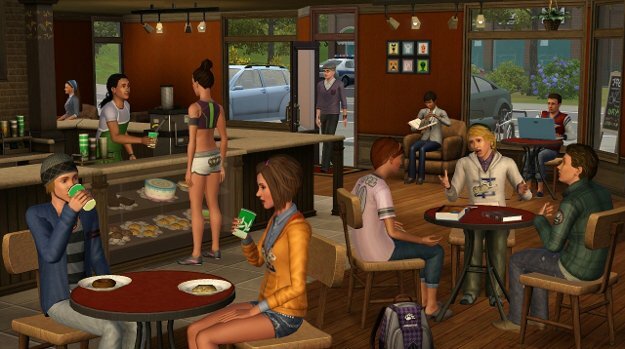 After all, the Sims have espresso and mixed drinks. Why not tea? And there is tea and energy drinks that they can access from the University coffee bar object, which also displays treats and snacks that they can buy. However, there are no options to make these things at home. There is no teapot object. The options aren’t added into the bars, they are not added into the home bars. As a matter of fact, when growing herbs and beans the only real application for the Sims growing them or buying them seems to be in spiking food or bonfires. It turns what could have been an interesting expansion of the Cooking skill/home experience into a glorified hippie and druggie fest. No offense intended to hippies or druggies. This expansion is just a hodgepodge of ideas that are poorly executed and put together in a fairly lackluster way. It’s disappointing to see them take an actual cool idea and strip away concepts that worked without adding or improving upon them. And it’s equally disappointing to see that some of the new additions seem to just be lacking. Yes, there are some cool new objects, like the bowling alley and cool additions like the comic books. But I feel as if none of these are significant enough to detract away from fundamental flaws in game play. The University experience is not fun here. It’s not any more significant than it was the first time it was introduced and is actually more obstructive to play than its previous incarnation. It is mediocre at best and I think a poor example of what the Sims has grown into as a gaming experience.